Many painters from Picasso to El Equipo Cronica and other artists have riffed on some of Diego Velasquez's most famous images. 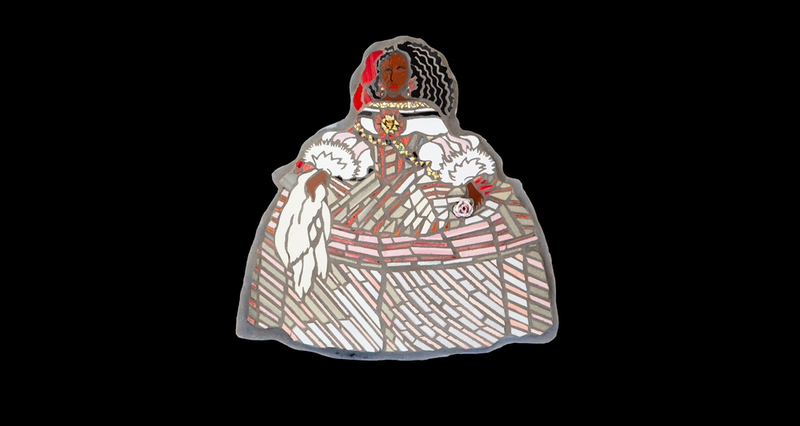 While living in Madrid, Spain in the late 1960s and throughout the 1970s I saw the wonderful pop-art ceramic figures based on Las Meninas and other iconic Velasquez paintings made by two artists who called themselves El Equipo Cronica. o now it is my turn to do some pop-art "Velasquez" mosaics-- based on the paintings he made of the Princess Margarita at two ages of her childhood. And who better to represent the new American princesses than the daughters of our President, Sasha and Malia. Sasha's image comes from Las Meninas and Malia's image is a portrait of the "infanta" (as the princesses are called) done a few years later. The mosaics are made of glazed tile cut on a ring saw, permitting very narrow and curved cuts. A few porcelain roses cut off of thrift-store artifacts and some 24 karat gold Orsoni tesserae (from Venice, Italy) add glitz and dimension to this pair of wall hanging mosaics. I teach the use of hand-made mosaic smalti at the Santa Barbara School of Mosaic Art where many other workshops are available. learned the ancient art of mosaic making at Luciana Notturni's Ravenna Mosaic Art School in Italy..